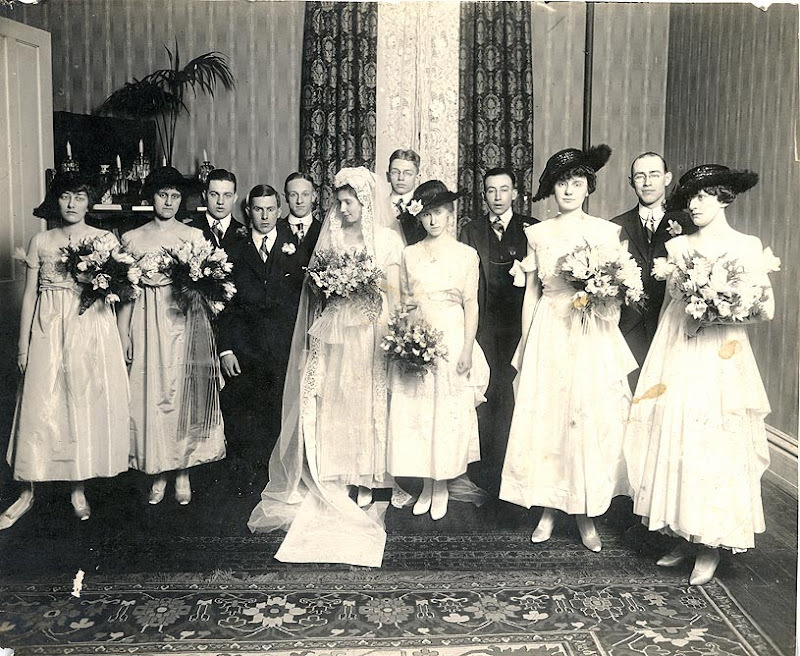 Forgotten Faces and Places: The Happiest Wedding Party EVER!!! I hope they had a good marriage, because the wedding looks like a funeral! Did you ever see such a bunch of miserable people? Honestly! Maybe it's the awful dresses! The second from the left looks like it still has fold marks in the fabric. And this being the Age of Crappy Hats can't help either. They all look like prototypes for the attack fleet of Ming The Merciless! Black hats, white dresses! Who was the wedding planner on this fiasco!? The pretty bride has the only smile in the house. The groom & best man look like they both ate worms! Amazing! I have a photo with the exact same signature George Freeland of a wedding party and was trying to locate the geographic area of same. It is monochrome possibly from the 1940's but could be earlier.